I am happy to write that Anna von Reitz provides us with a brief status update both in Paragraph 1 and at the end of her article #731 published today. She is honest and acknowledges that the can was kicked down the road another 90 days, and perhaps this might forestall some portions of the RV. It does appear that at this point the time frame might not be etched in stone, the way I read it her first paragraph. A bit of intel: Today, I had an unexpected communication with an individual who will be doing several large projects and hence is extremely vested in and on top of the zillions of funds to be released. This person told me on good authority that "Judge Anna and Grandfather are working very well together" to get this all sorted out. I believe this person and will share more if I am able. In my opinion, this is EXCELLENT NEWS. From the last few paragraphs, we can fully see that this GCR/RV is not only dependent upon what gets done in America, or what gets done to America. ALL OTHER COUNTRIES have a vested interest in converting to unincorporated governments, and I can hear the clack-clack of all those legal documents being typed around the world accomplishing this as we speak, and indeed, I imagine this has long been under process. We want the sovereign governments and the worldwide economic atmosphere that all the people of the world deserve to be accomplished properly. Anna points out that a corporate government cannot be sovereign, and if we reflect on President Trump's emphasis on sovereignty on Tuesday, we now understand that he was referring to all nations retooling their governments! We want this GCR to be done once, to be fair and smooth, and to STICK, once it is done. Do-overs would be a nightmare!! I have faith in our legal team in America, certainly in Grandfather, who we all want to meet some day, and in our hard-working Chinese and Russian partners, who have done so much towards a multilateral world of peace. Many details are still up in the air right now, as we can see from all the conflicting intel, but one fact appears to be coming into view: The bankruptcies of the Municipal and Territorial United States government services corporations have been a necessary mechanism from which to create a blank slate -- terminating all corporate governments of the world, including the UN corporation - in order to RESET OUR NATION STATE UNINCORPORATED GOVERNMENTS, THE WORLD BANKING SYSTEMS, and FAIR AND ASSET-BACKED CURRENCIES FOR ALL NATIONS. Whether this should wrap up this week or several weeks from now, this is a gargantuan endeavor worthy of and deserved by humanity, and I fully support all those of good intent working so diligently for us all. The way the world is organized reflects the way the Earth is organized in separate "realms" of air, land, and sea. Finally, there is the Land which is national in nature. This is where you find - in America-- county and state law. Remember that in our country each state is a nation, so that the words "interstate" and "international" mean the same thing for us. This is the realm of American Common Law and the actual Constitution. Please note that there are many forms of "Common Law" and you must specify "American Common Law" or you may easily find yourselves operating under "Martial Common Law" or "English Common Law" or whatever else a particular court may have on offer. So--air, land, and sea also translates as global, national, and international. All incorporated entities (called legal fictions) are ultimately created in the realm of the air by the Roman Curia. C Corps, S Corps, LLCs, Trusts, Foundations and Cooperatives have all been created by the Roman Catholic Church's Secular Hierarchy headed by the Pope in his Office of the Pontiff. So, although these things all function in the realm of commerce and under the Law of the Sea, they have their genesis and domicile in the realm of the air. As a result, the Pope and the Curia can control and disband any corporation on Earth -- including those functioning "as" governments. The American situation is unique because its governmental functions in international jurisdiction have always been split between the delegated functions exercised by the British-controlled Territorial Government dba "United States" and the non-delegated "reserved powers" of the actual United States government doing business as The United States of America. Both the Territorial United States and the Municipal United States have long since been converted into corporations under the ultimate control of the Roman Curia and the Holy See, yet functioning in the realm of international commerce-- under the day-to-day control of the British Monarch. The Popes and the British Monarchs thus surreptitiously empowered have contrived to "redefine" the nature of government on Earth into a form of Commercial Feudalism. On the land there remain the Unincorporated Governments of the Earth--- the land jurisdiction governments of the nations of the world which have fallen asleep and one by one been overtaken by the creeping commercial rot from within. It has been the apparent intention of the Popes to incorporate all government organizations worldwide by offering these organizations benefits-- like the ability to go bankrupt, known as "limited liability"--- while purposefully leaving their own government, the Holy See, as the only unincorporated (and therefore only sovereign) government. 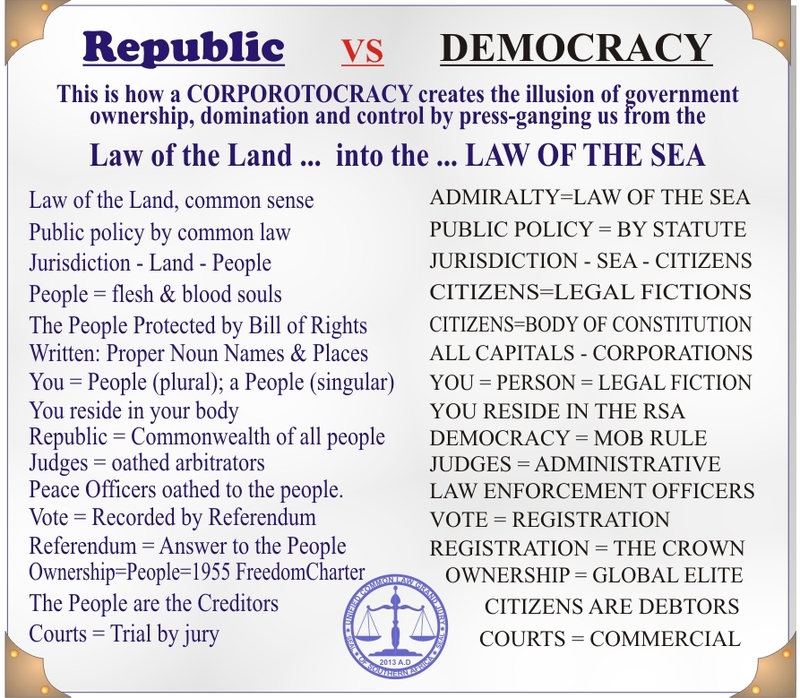 Thus the scam has been to entrap and enslave both people and lawful land jurisdiction governments as "franchises" of governmental services corporations -- all of which have been subjected under the rule of the Holy See. And the land jurisdiction governments and the people have been enticed into this "system" based on "benefits" which they have literally paid for themselves. At which point it becomes self-evident that we have-- the entire Earth-- suffered at the hands of crime syndicates masquerading as the lawful government of Great Britain and the Roman Catholic Church: evil in high places, indeed. The "United States" is not America and not the American states. It is high and holy time that all the people of the Earth woke up and put a stop to this fraud and demanded an end to this "system" of things. We left Feudalism and Robber Barons behind a long time ago and, speaking for the American States and People--- who are the Priority Creditors of all these bankrupt Territorial and Municipal corporations worldwide--- we see no reason to go back to the Dark Ages.